The content below contains images and a transcript of the Slidecast available at nanosciencework.org. 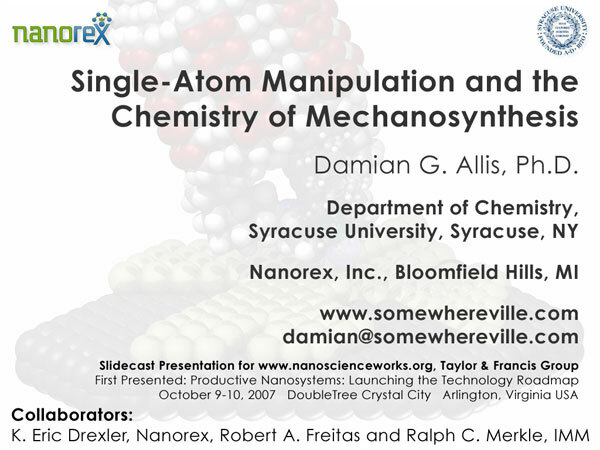 This is Damian Allis with a slidecast introducing aspects of single-atom mechanosynthesis, including a discussion of nanoscale mechanical manipulation, the computational study of single-atom tooltip designs, and some general considerations being addressed by computational modeling. Additional content, including images, definitions, and the transcript of this slidecast, is available at www.somewhereville.com in the slidecast category. 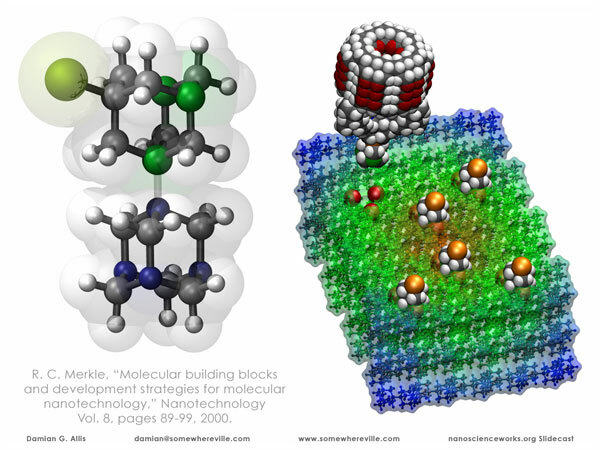 In the early 1990’s, when the word “nanotechnology” referred to what is now known as “molecular manufacturing“, and was just entering academic circles and scientific discussions, this is what came to mind. Not “mostly 7,7 carbon nanotubes of more or less 20 nm,” not “gold nanoparticles with a 2 to 5 nm diameter range,” not “chemical reactions with greater than 95% yield,” but “bottom up put it where you want it to make exactly what you want.” Molecular manufacturing, put forth by Eric Drexler, led to great discussions, heated debates, but limited scientific study beyond the contents of his book Nanosystems, this a result of the then-state of experiment and the computational cost of high-level calculations to test not the feasibility of molecular manufacturing, but the fundamental premise for the original vision – the mechanical manipulation of atomic and molecular feedstocks to form new products, or mechanosynthesis. The last two decades have seen tremendous progress in both experiment and theory, making the reinvestigation of some of this visionary work possible to see how much further along we are, or can be in the near future. Mechanosynthesis is the positional control of feedstocks, or chemical reactants. Positional control leads to orientation control, important when your feedstock is either structurally asymmetric, like a brick, or chemically asymmetric, such as a molecule with a symmetric frame but functionalized faces. Mechanosynthesis almost has to occur under strict environmental control, as reactive groups being deposited may remain reactive and retention of that reactivity may be a vital part of a fabrication process. Mechanical positioning enables, in theory, the fabrication of highly interconnected structures. We’re familiar with highly cross-linked polymers made in solution. 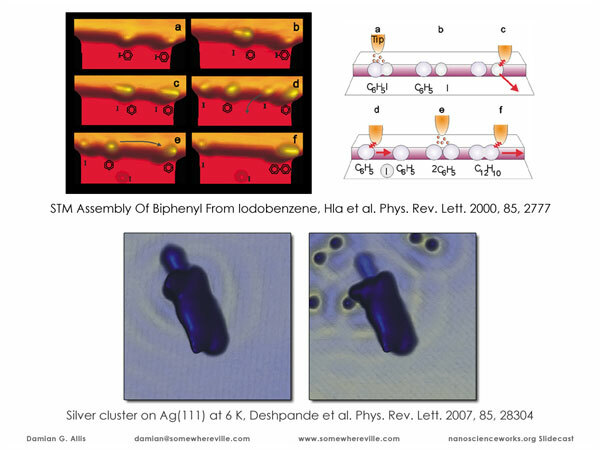 By control of reactivity and position, mechanical deposition should enable the placement of monomers that interconnect beyond the statistical methods achievable by solution-phase chemistry. Finally, mechanical positioning can be combined with programmable control. Using computer aided design software, the fabrication machinery can be entirely computer-driven to manufacture a desired product, similar to macroscale processes. 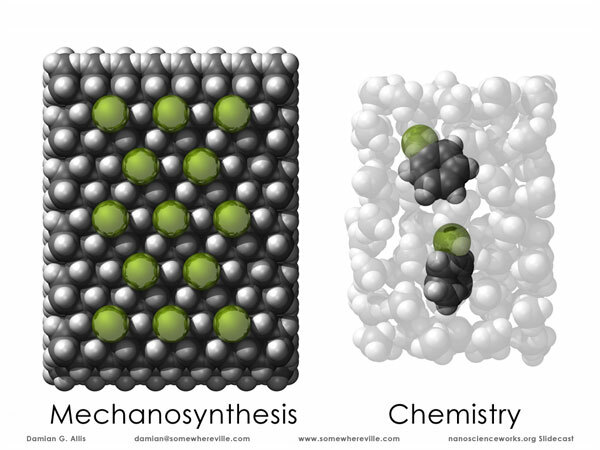 Comparing chemistry and mechanosynthesis. To your left is a lattice with a series of atoms bound to the surface. 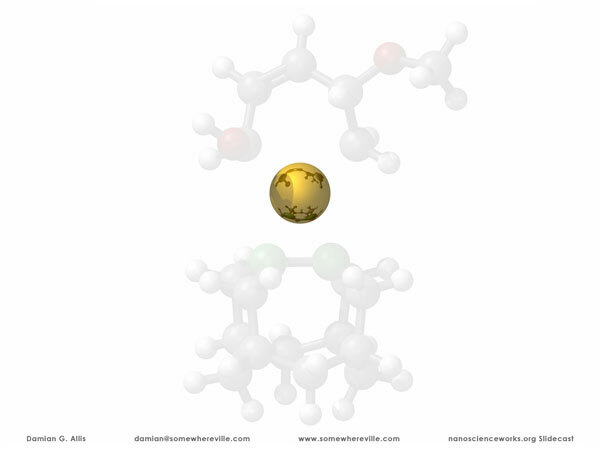 To your right, two derivatized benzene molecules in solution. The workspaces, or physical environments, of these two cases are obviously different. Now consider the control we use for making and breaking chemical bonds. Mechanosynthetic operations are performed under external control. With the laboratory frame defined, we know that exact arrangement of atoms and their lattice positions. You can tell a machine to “go to position 7,” a sufficiently calibrated machine can move a probe tip to it, and some operation can be performed. 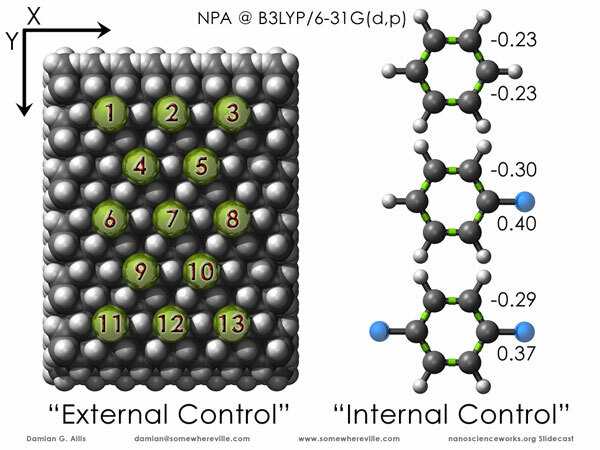 Synthetic chemistry is based on internal control. The vast repertoire of organic synthesis is founded in the asymmetry of molecules and the use of chemical reactions that exploit that asymmetry. Changing the covalent framework changes the reactivity, which is why most synthetic reactions are defined with respect to functional groups, such as alcohols or halides. The natural population analysis for benzene and two fluorinated derivatives are shown at right. The carbon atoms in benzene are net-negative due to withdrawal of electron density from bound hydrogen atoms. Exchanging one hydrogen for a fluorine leads to a dramatic change in the charge of the bound carbon and the neighboring carbon. The difference between fluorobenzene and paradifluorobenzene is smaller, a statement on the local nature of inductive charge shifting using sigma-bound functional groups. This asymmetry in electron density is our handle when we perform synthetic operations. 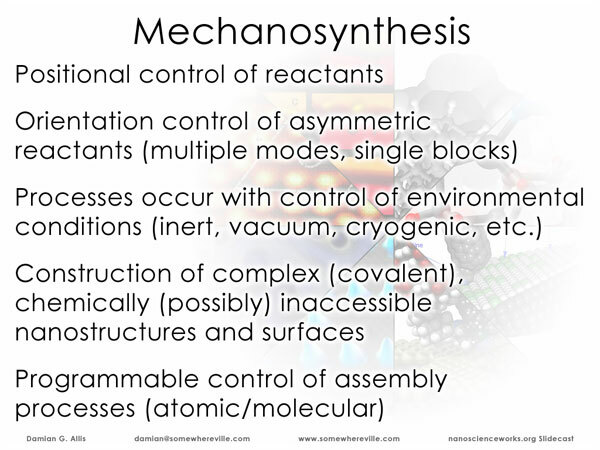 Given this fundamental difference in control, what does mechanosynthesis get us that synthetic chemistry might not? I’ll use a few cases that lie a bit beyond current capabilities but are certainly within sight. 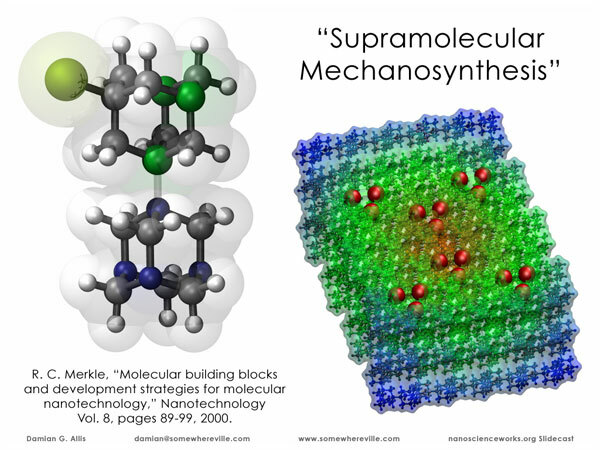 The first example is one of supramolecular mechanosynthesis, an extension of an approach proposed by Ralph Merkle using molecular building blocks to make a lattice with the geometry of diamond but far weaker subunit interactions. Instead of pruning a bulk material composed of these tetrahedral subunits, consider a slightly different form of lattice modification. Suppose that the goal is to pattern a surface in a very specific manner, such as the arrangement shown by triangles of red spheres. While this may be possible by a series of solution-based approaches or one large molecule, achieving absolute positional control on a defined lattice is between nontrivial and impossible by typical chemical or supramolecular approaches. Mechanical modification at the molecular level seems more straightforward. The fabrication of highly complex patterns that have no clear solution-based origin can be envisioned using probe-based techniques that remove molecular building blocks from lattice sites and position functionalized building blocks at those same positions. The mechanical modification of molecular crystals is a promising stepping-stone on the way to similar approaches involving finer levels of control and, ideally, smaller building blocks. Additional Information: Chemical modification at the level of individual atoms. 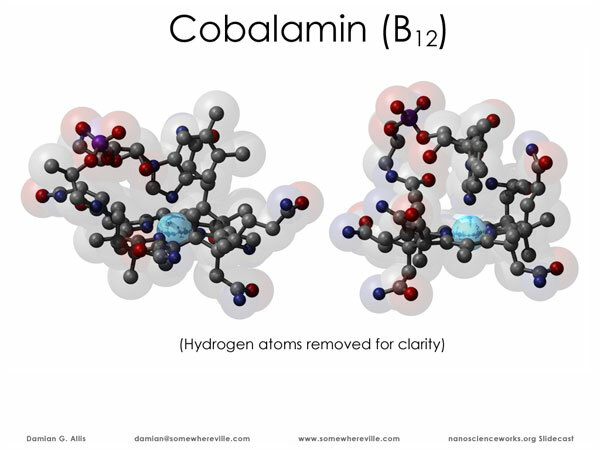 Shown here are two views of Cobalamin, Vitamin B12. Inspection alone reveals the extent to which this molecule is highly asymmetric, replete with different, sterically-unrestricted pendant groups. At the atomic scale, Nature, or the biological machinery of the living cell, abhors symmetry. Molecular asymmetry in structure and synthesis is the handle by which B12 and virtually all other biological molecules are both synthesized by enzymes, cellular machinery that preferentially binds and acts on particular functional groups, and recognized by other enzymes (for B12, this specific recognition occurs in the digestive system). Again, asymmetry is the key to B12 synthesis and use, the most recurrent them in all of biochemistry and chemical synthesis. C222, a gigantic aromatic molecule or a very small graphitic sheet, depending on your profession. This molecule is large and highly symmetric, with symmetry-related carbon and hydrogen atoms largely undifferentiated in terms of chemical manipulation. Suppose, having placed a functional group at position 1, you needed to place a second group at position 4. Even a strongly electron-withdrawing group at position 1 would be hard-pressed to change the electronic structure enough to direct a reaction at position 4 and not positions 2 or 3, meaning the desired functionalization would have to be somehow performed early in the synthesis. Now place the C222 on a surface. Here, a 1 and 4 di-substitution is not simply about chemical yields on the milligram scale, but means the difference between, for instance, a completed circuit and a wasted assembly effort. 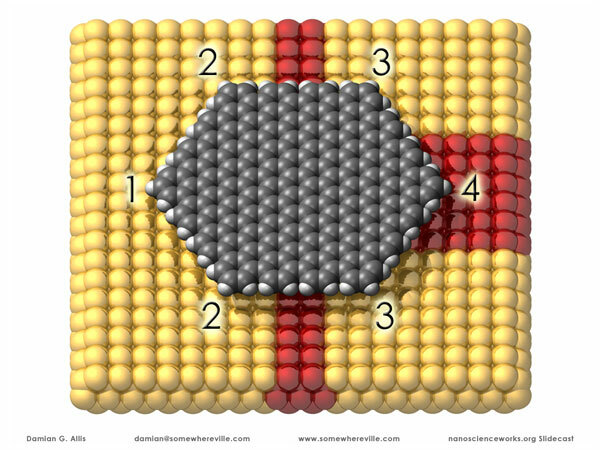 If the surface is patterned as shown, one might have the ability to chemically modify position 4 preferentially over 2 and 3 based on subtle differences in the interaction between the arranged red atoms and the “4” corner of C222. That said, an absolute-position mechanical approach for modifying any position in this example can be argued as the more straightforward route. 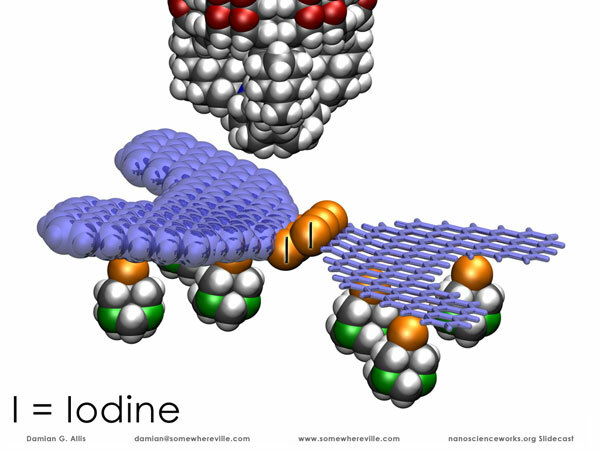 Now, combine the two, a patterned surface and a modified graphitic system, with the goal being the formation of covalent bonds at very specific locations for making molecular circuits or structurally complex molecular templates. In a highly complex, chemically undifferentiated patterned surface, chemical control of covalent bond formation is extremely difficult to design, much less implement. With this patterned surface defined in space, however, mechanical approaches to chemical bond formation become a very attractive possibility. Additional Information: Somewhere between impossible and eventual, depending on who you ask, lies the fabrication of structures such as these, rigid diamondoid frameworks. That structures such as these are unapproachable by synthetic chemistry is probably not in much question, and it would be a tremendous exercise to sketch a reaction sequence from small feedstocks to large, high symmetry structures like these. 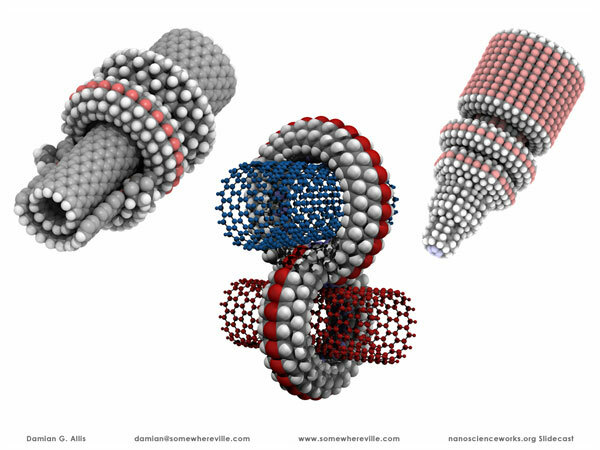 Whether mechanosynthesis becomes the tool for fabricating nanostructures such as these is one of the long-term questions we in molecular manufacturing hope to answer. I find it somehow comforting that, despite our current understanding of atomic and molecular phenomena, trained scientists still have serious debates about the feasibility of making molecules such as these. Is there any experimental proof to even begin to support these claims? Of course(! ), with the two experiments shown here the most dramatic examples of atomic manipulation and positional control to date. 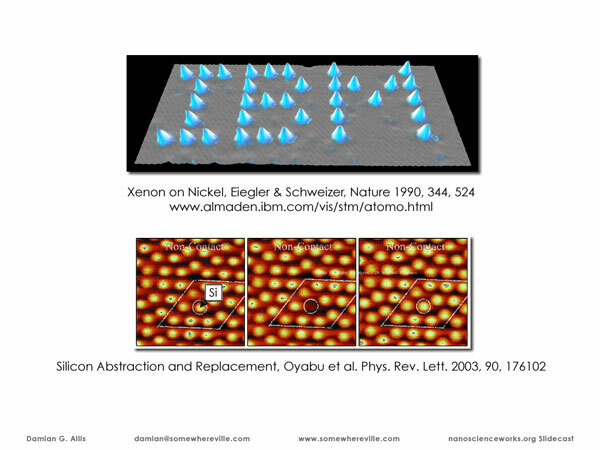 The first shows the spelling of IBM using Xenon atoms positioned on nickel lattice sites at 4 K. This is not covalent mechanosynthesis, but demonstrated that atomic positioning is possible and, importantly, that the properties of the workspace, here the nickel metal, play a profound role in guiding atomic positioning. 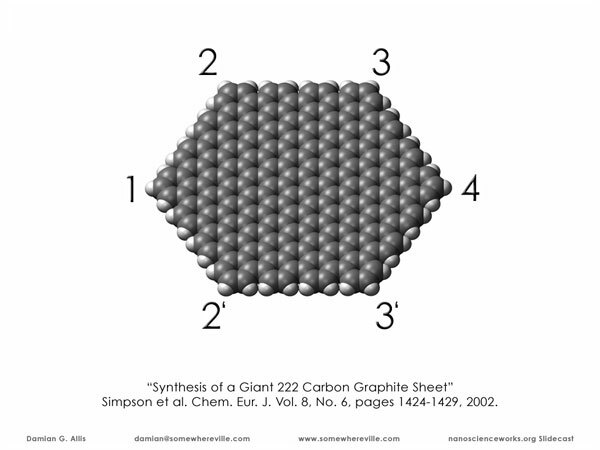 Thirteen years later, the first definitive example of covalent mechanosynthesis was demonstrated with the selection, removal, and replacement of a single silicon atom from a lattice site. The next levels of mechanical control come with the manipulation of molecules, operations more akin to familiar chemistry. 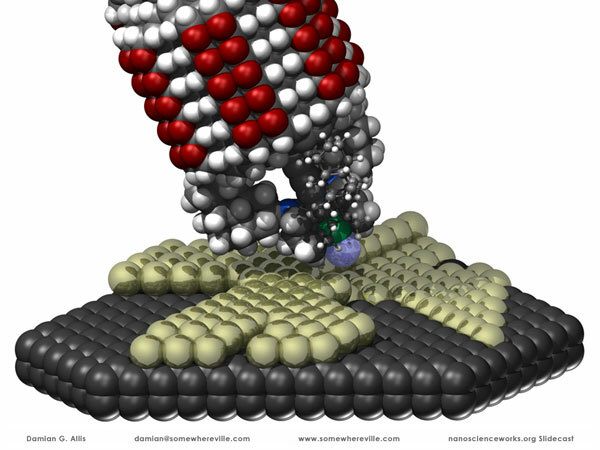 In 2000, the mechanosynthetic assembly of biphenyl from two iodobenzene molecules on a copper surface was demonstrated, using a scanning tunneling microscope tip to break carbon-iodine bonds and position the benzene radicals. Another example of atomic manipulation on molecule-size structures is the atom-by-atom deconstruction of a silver cluster in 2007. To these four examples can be added many other demonstrations of mechanical operations at the atomic or molecular level. A considerable gap exists between these fundamental demonstrations of mechanosynthesis and potential applications. We are fortunate today to have a number of well-documented first steps and current manifestations of radical breakthroughs. 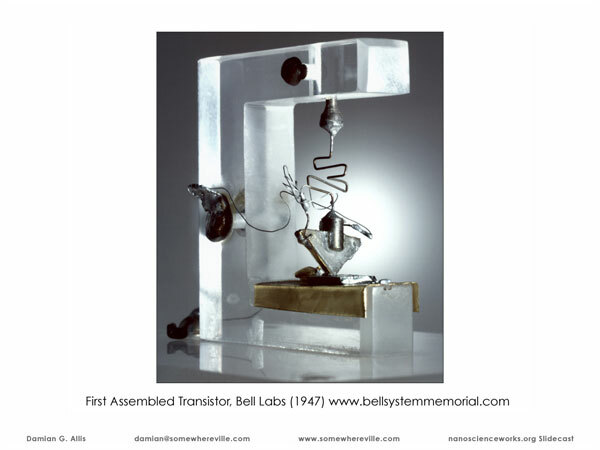 Many of you viewing this slidecast live and die by the descendants of this: the first transistor. A Pentium 4 processor has 42 million of these in a chip small enough to hide in your hand. Simply, it does not take long for a proof-of-principle to become both highly developed and widely implemented, and this length of time gets shorter with improvements in all other technologies. View these mechanosynthesis examples in this light. 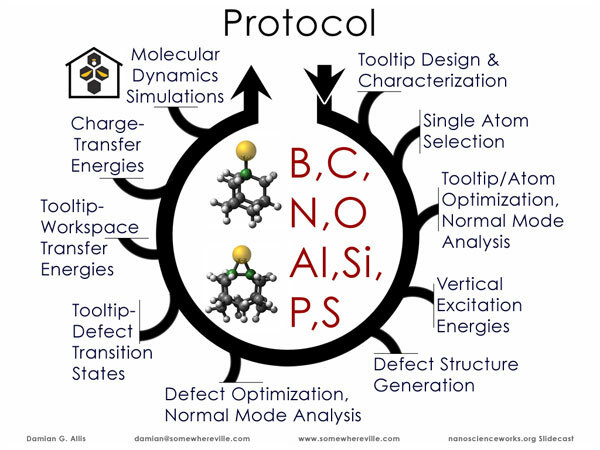 On the theoretical side, tooltips for manipulating carbon dimers have been the focus of a number of computational quantum chemical studies. One recent paper reports a survey of various carbon dimer tooltips, using transfer energies and ethynyl and carbenic defect structure accessibility as metrics for proposing best designs. A feedstock not stably bound to its tooltip is of little use in a mechanical assembly process. 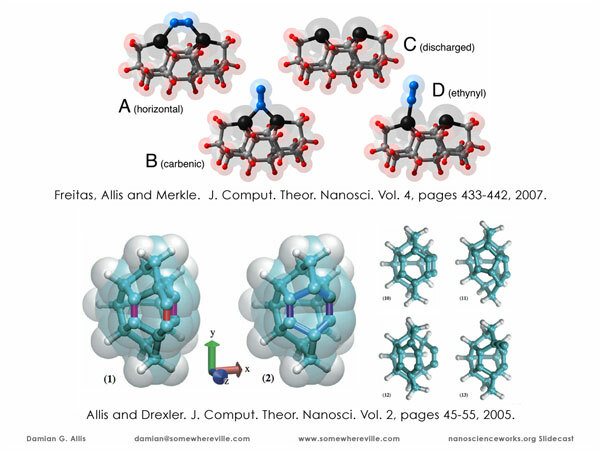 The approach in this paper used germanium-based adamantane frames to bind the carbon dimer, as the germanium-carbon bond is considerably weaker than the carbon-carbon bonds one would make in diamondoid or graphitic mechanosynthesis. A second approach proposes carbon-only frameworks and pi-delocalization to stabilize the discharged tooltip. The accessible defect structures of this second tooltip were explored in detail, as well as transition-state calculations to determine their accessibility under operational conditions. Additional Information: Other theoreticians have also considered mechanosynthesis. Some of the first studies were reported by the computational nanoscience group at NASA. 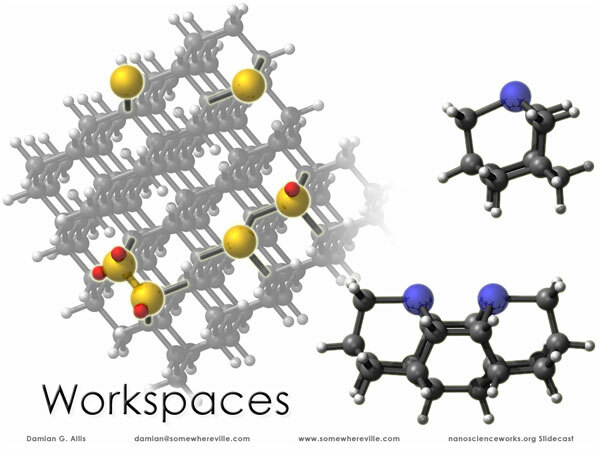 These include the deposition of carbon dimers onto diamond workspaces using nanotube tooltips, shown at left, and an operational proposal for computer memory, using the interaction between a pyridine molecule and either fluorine or hydrogen to represent a 1 or a 0. This memory example is not, in read-only mode, particularly mechanosynthetic, but one can imagine the control systems required to accurately address single atoms on the tightest atomic lattice we can expect to use for real-world applications. The carbon dimer is a small feedstock, but the single atom is the ultimate building block and, therefore, the ultimate target for mechanosynthesis. The demonstration of single-atom control, either experimentally or by prediction from computational studies, only adds weight to the feasibility of mechanosynthesis for a multitude of applications. For theoreticians, there’s also the practical side. A smaller building block means fewer atoms to calculate. The quantum chemical calculations for small systems can be run at higher levels of theory in more reasonable timeframes, meaning the reduction in system size improves the quality of our predictions. The collaborators and I have been exploring single-atom tooltips, small systems that can stably bind single atoms that may enable their transfer and deposition. 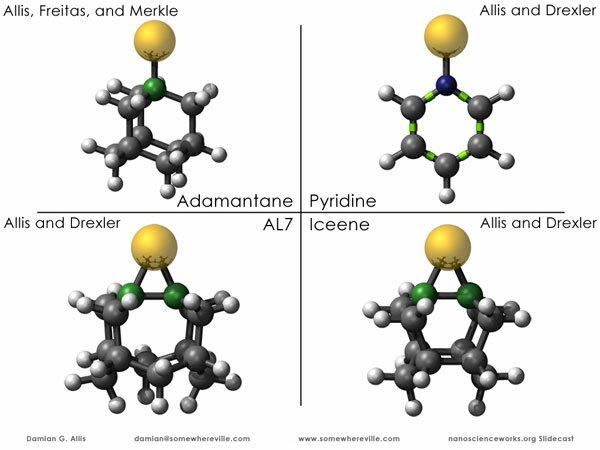 To date, density functional theory calculations have been performed on the four systems shown here, including adamantane, pyridine, iceene, and a slightly larger iceene frame called AL7. Along with their modeling, we’ve begun developing a protocol around the analysis of their results to consider these and subsequent tooltips from an engineering perspective. To date, the design and modeling studies have involved hundreds of structure calculations and analyses, all of which feed into various sections of the protocol. Beginning with the tooltip design, we select atoms we think the tooltip may be able to stably manipulate, followed by geometry optimizations and normal mode analyses to determine the tooltip minimum energy form. Some designs fail immediately at this point. 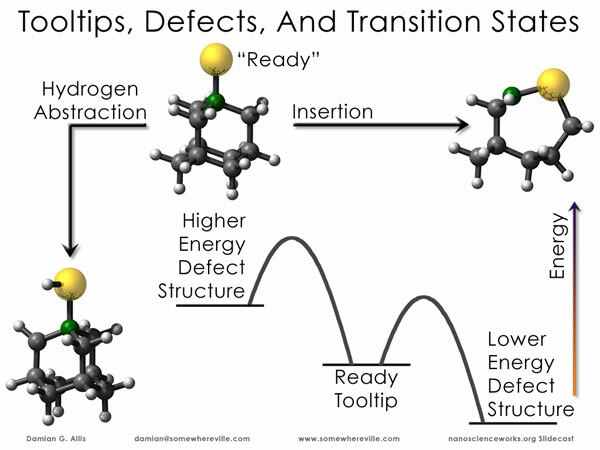 Structural defects are a chemist’s unwanted side reactions. While a defect population might be tolerated in a chemical synthesis involving 1020 or more reactions, a defective tooltip in a mechanical assembly process is useless, meaning their identification and accessibility from the ready tooltip are important steps in the protocol. After the tooltip has been characterized for stability and potential defects, the transfer of feedstock atom to workspace is the key piece of information determining if a mechanical assembly is possible. Finally, combined quantum mechanics/molecular mechanics studies of the tooltips and their accessible defect structures are in the works with the nanohive@home project thanks to the donations of spare cycles by participants too numerous to mention. The exhaustive summary of the tooltip calculations will be saved for upcoming publications, but general analyses are straightforward enough to describe in brief. As one very brief summation, this slide shows an adamantane tooltip in the “ready” position and hydrogen-abstracted and feedstock-inserted forms, two defects any chemist would point to as being accessible, possibly energetically-favored arrangements. 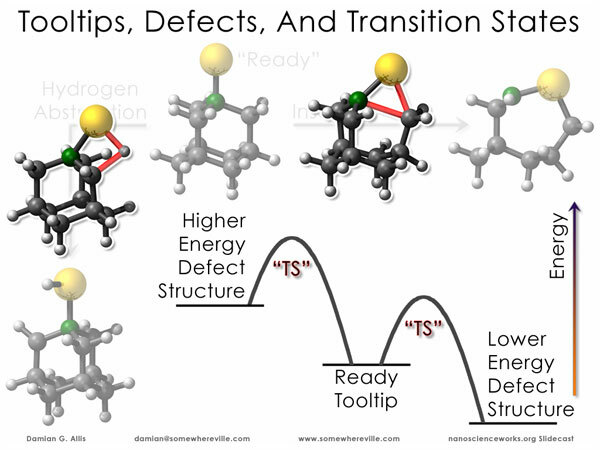 A tooltip with bound feedstock must be stable during the transfer to the workspace, meaning that one must consider the tooltip falling apart internally, just as a synthetic chemist might worry about intramolecular rearrangement in an unstable intermediate. Geometry optimizations of these and many, many other possible defect structures enable us to predict if the defect structures are higher in energy, and therefore less likely to occur, or lower in energy, and therefore possibly more likely to occur. We not only want to diagnose the relative energies of possible failure modes, we want to know their accessibility from the ready tooltip, so we model not only insertion, hydrogen-abstracted, and many other potential defect structures, but also perform transition state calculations to identify minimum-energy paths through which each defect structure might form. … but also stable over the course of, and after, a deposition process. Other issues that need to be addressed are listed here. First, how does one end up with a tooltip and bound atom? For some atoms, the chemistry is already known. A bare silicon atom on an iccene, that’s another matter. Can we modulate the relative energies of single-atom binding by altering the tooltip framework? Given what a fluorine atom does to a benzene molecule, how might we change the binding energy of a single atom by tooltip modification? I would argue that positional control in a mechanosynthetic context was sufficiently demonstrated with single-atom silicon manipulation, although the use of tooltips introduces other positional issues scientists are only on the verge of addressing. Energy transfer – forming two covalent bonds on a workspace with an atom bound by a single bond to a tooltip would commonly be a very energetically favored, or chemically exothermic, process. Ideally, that energy goes into considerable vibrational excitation and not the breaking of weaker neighboring chemical bonds. The computational requirements to model that process are considerable by today’s standards. 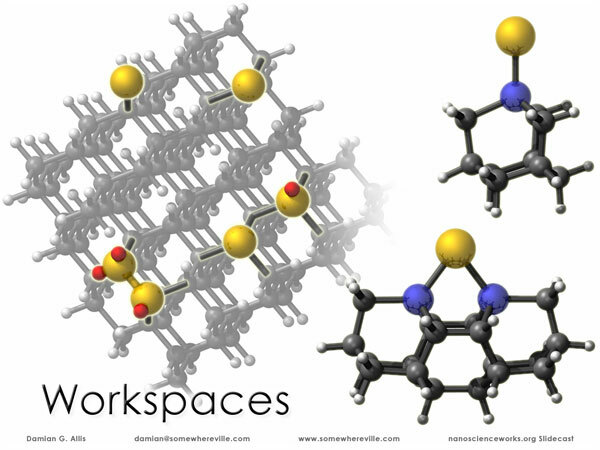 Workspace engineering to end up at deposition-ready motifs is an involved design process, but one with very important consequences beyond the fabrication of simple raw materials, branching into surface catalysis and custom binding surface modification. Finally, the predictive power of any theoretical method is contingent on the accuracy of the model. 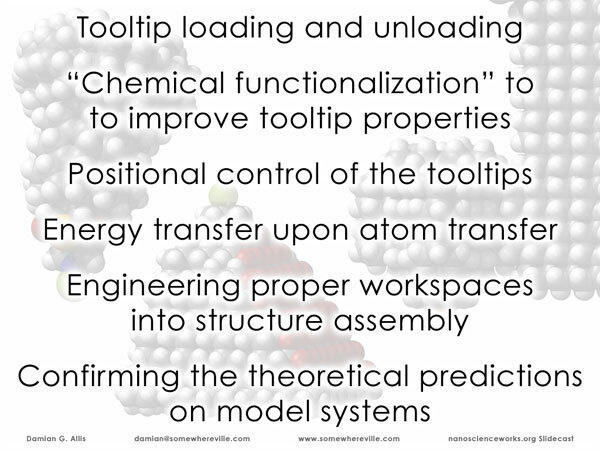 While the calculations on these tooltip structures are being performed at fairly high levels of theory, any craftsman will tell you the importance of “measuring twice and cutting once.” The goal of all the theoretical work being performed is to provide experimentalists with the best possible predictions, not to create an entire molecular manufacturing manifold within the confines of a theory space defined by the limitations of one particular computational methodology, right? Everything can be made to look good on paper, but the most complex molecular manufacturing theoretical study is far less interesting than the simplest laboratory demonstration. 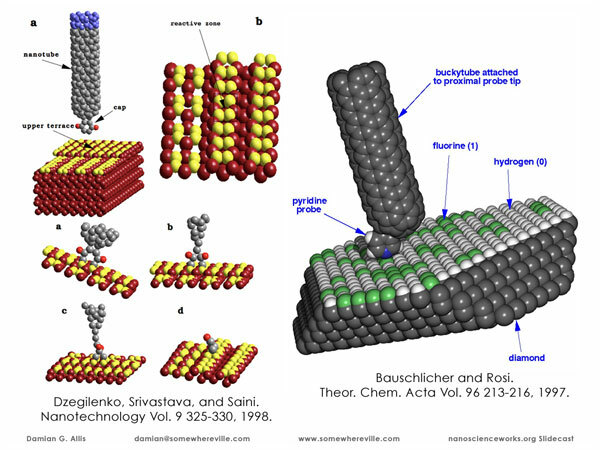 We hope, with the theoretical work, to help direct that first experimental effort of tooltip-based covalent framework mechanosynthesis, to make it work the first time. Fundamental demonstrations of atomic and molecular manipulation are still being published that do as much to herald the success of an experiment as to further demonstrate the simple feasibility of mechanical approaches at the nanoscale. Relevant to the longer-range vision of highly structured tooltip assemblies that manipulate atoms and molecules at the level of individual chemical bonds, a great deal of computational work remains to be done, with theoretical studies helping to spur experimental studies by employing the predictive power of computational chemistry to identify candidate systems worth pursuing in the laboratory.